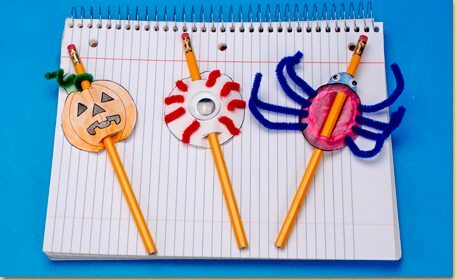 Scare your friends at school with these spooky Halloween pencil toppers! Download, print and cut out the templates. 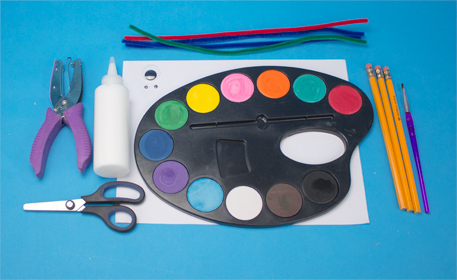 To download the template, click the “template” button beneath the project image. Start with the giant eyeball. Cut and bend small pieces of red fuzzy stick. 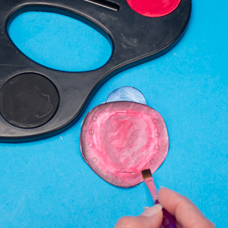 Glue the pieces around the eyeball, using the template as a guide and add a giant wiggly eye to the middle. 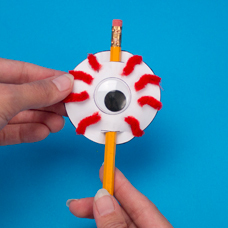 To complete the eyeball pencil topper, cut the 2 horizontal lines on the eyeball and slide it on the pencil, as shown. Paint the pumpkin and let dry. 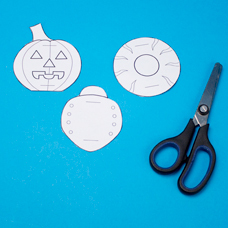 To complete the pumpkin pencil topper, cut the (2) horizontal lines on the pumpkin and slide on the pencil. Cut and twist a small piece of green fuzzy stick. 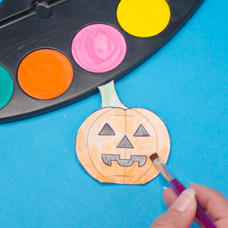 Wrap it around the pencil to create a vine for the pumpkin. 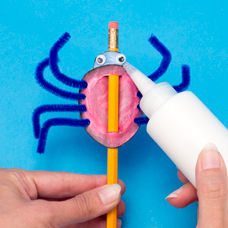 Paint the spider’s body and let dry. 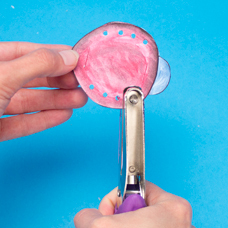 Using the template as your guide, punch (4) holes in each side of the body. Cut the 2 horizontal lines on the spider’s body. 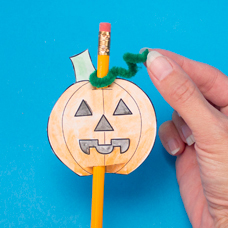 To keep from covering the spider’s head, slide the spider on the pencil the opposite way as the pumpkin and eyeball. To make the spider’s legs, cut (4) blue fuzzy sticks in half. Thread one of the cut pieces through the top holes in the spider’s body, making sure to go across the back of the pencil, as shown. Finish the spider by adding the rest of the legs. 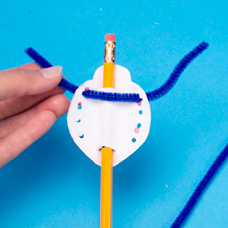 Bend the legs and add wiggly eyes to the head.